For days, the anxiety has been building. A feeling of restlessness and a fear that I will never be prepared enough. A week back, I trudged to the basement and hauled a suitcase two floors up. It sat there on my dresser collecting toys and odd scraps of paper that the twins decided was essential to bringing home baby sister. Waving husband and kids off, I turned my attention to the increasing need within me to organize. All of the purchases I had made online sat tags intact in my old dresser. I kept it out of sight for fear looking at them would jinx something. Today, I gathered enough courage to sort through the itty bitty outfits, the crib sheets and the numerous things that would make our home ready for baby. Picking through the piles, cutting the tags out, I threw them in the laundry hamper. I next turned my attention to the suitcase and added my clothes to it. It was not packed and ready but it was a start. 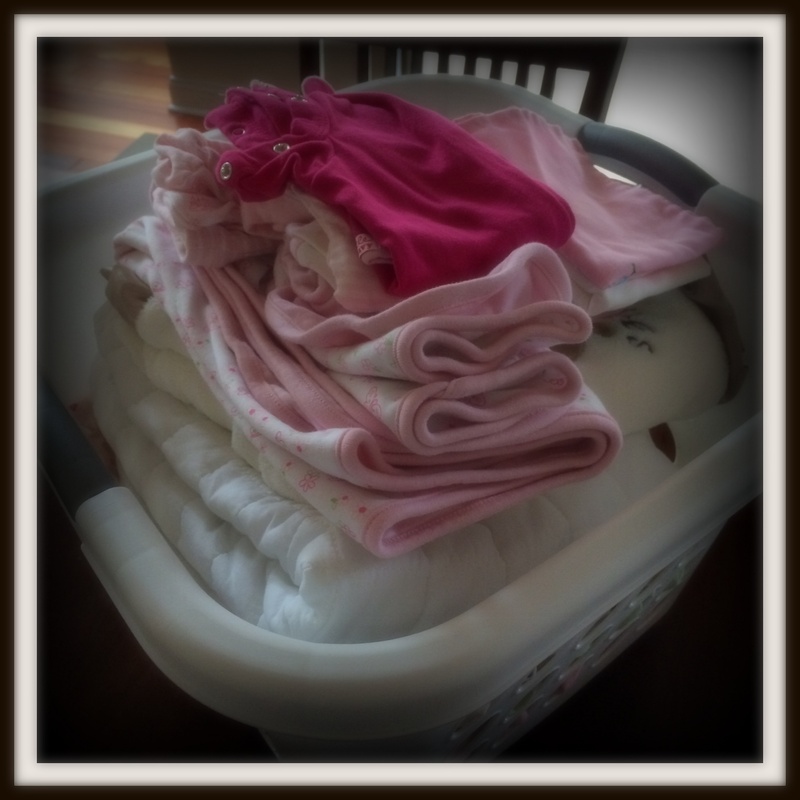 Starting the round of laundry, I watched the sheets and booties tumble and fall in hues of pastels. Walking away, I realized the baby could be here in as little as three weeks and it struck me how unprepared I was. I had read all about labor and giving birth. Yet I know my experience may not mirror what I had read about. Between being prepared and going with the flow I feel caught. My daughters have left traces of their morning time play everywhere I turn. While I worry about the changes to my life, had I done enough to prepare them for everything that is to come? I feel a fresh wave of anxiety. I fold and put away strewn clothes. I try to relax but my mind is on overdrive. Too tired to nap, I give in to the rush of hormones and tackle the clothes that tumble warm and ready from the dryer. Folding each piece away, I focus on the positivity I should be feeling. Slowly my breathing feels even. The pastel pinks are strangely calming. I hold them close to my face and repeat to myself. All will be well. Next Milestones – 5 years!